The overflow from Excelsior Geyser leaves a colorful trail. 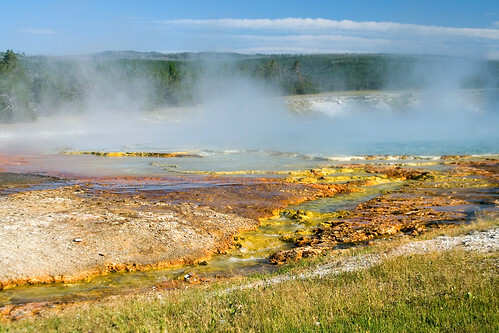 Excelsior Geyser Crater contains a thermal hot spring which discharges over 4,000 gallons of water a minute. This entry was posted on May 22, 2008 at 4:27 pm and filed under crater, Excelsior Geyser Crater, geyser, Midway Geyser Basin, National Park, steam, thermal, vacation, water, Wyoming, Yellowstone, Yellowstone National Park.